What is Small Bowel Cancer? Small Bowel cancer (also known as small intestine cancer) is a rare cancer that occurs when malignant cancer cells grow in the tissue of the small intestine. The small intestine is part of the body’s digestive system and is a long tube that connects the stomach to the large intestine. The role of the small intestine is to absorb the majority of the nutrients and minerals from food. Over time, small bowel cancer may grow and block the small intestine. The most common type of small bowel cancer is carcinoid tumour followed by adenocarcinoma. For more information on small bowel carcinoid tumours see NETs. Small bowel adenocarcinoma begins in glandular cells that are found in the lining of the small intestine, which are responsible for making and releasing mucus. Most of these tumours occur in the small intestine (mainly duodenum) near the stomach. Other less common types of cancer include sarcomas, lymphomas, and gastro-intestinal stromal tumours (see GIST). Early stages of small bowel cancer can often present with no symptoms or non-specific symptoms, which can also be commonly found in other illnesses. Most small bowel cancers are diagnosed late at more advanced stages of the disease. 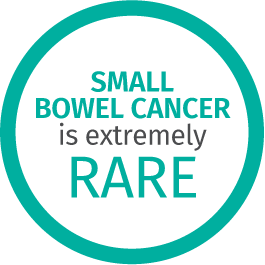 Small bowel cancer is rare. In Australia, around 648 people will be diagnosed with small bowel cancer in 2018. There will be an average of 2 new cases a day and 3 deaths a week. The five-year survival rate after diagnosis for small bowel cancer is 65.8%. There are lifestyle and health factors that can increase the risk of developing small bowel cancer. Family history of gastro-intestinal related disorders, including inherited disorders such as familial adenomatous polyposis and hereditary nonpolyposis colorectal cancer. The type of tests to diagnose small bowel cancer will vary depending on the symptoms and type of small bowel cancer. Common tests include blood tests. An abdominal x-ray may be required to provide a clearer picture of the organs and to see if there is any evidence of cancer. An endoscopy may also be performed by the medical practitioner to examine the small intestine and surrounding organs in more detail. A wireless video capsule endoscopy may be performed and it is a non-invasive procedure, which helps in visualising the entire small bowel. An upper gastro-intestinal endoscopy allows the doctor to examine the upper digestive tract, which includes the oesophagus, stomach and the duodenum. This is done using a thin flexible tube with a light. During the procedure, the doctor may also take a small sample of tissue, called a biopsy, to examine under a microscope to see if there are any cancer cells. A procedure called an “upper GI series with small bowel follow-through” may be performed. In this case, the individual drinks a solution with the Barium Sulfate and x-rays are taken as the barium travels through the individual’s upper digestive tract and small intestine. Alternatively, a CT enterography may be considered. This involves drinking a large volume of contrast (barium or water) and allows better visualisation of small bowel lumen under computed tomography (CT). The doctor may use other imaging technologies to see if there is any evidence of cancer. This may include computed tomography/positron emission tomography (CT/PET scans) or Magnetic Resonance Imaging (MRI). Surgery is the most common type of treatment for early stage, localised small bowel cancer. However, the type of surgery will depend on the location of the cancer and if it presents at an advanced stage.  If small bowel cancer is detected, treatment options include surgery, chemotherapy. Surgery may be performed to remove any cancerous tissue. The amount of small intestine that is removed depends on the location of the cancer, how extensive the affected area is and if it has spread. If a tumour is blocking the small intestine, a bypass surgery will be performed. Chemotherapy may be given during or after surgery to kill any cancerous cells. There is currently no screening program specifically for small bowel cancer. Australia has a National Bowel Cancer Screening Program (for large bowel cancer) that provides free and easy bowel cancer tests for individuals aged over 50. You can learn more about the National Bowel Cancer Screening Program by clicking here. Avoiding the risk factors can help to reduce the chance of developing small bowel cancer. Protective steps include physical activity and maintaining a healthy body weight. This includes changes in lifestyle habits, such as having a diet high in fibre, eating fresh fruit and vegetables and cutting down on processed meat.